This book was everything a typical Dan Brown novel should be: fast paced, full of twists and turns ensuring nail biting tension, adventurous, secretive, mysterious, thrilling with romance in between. For me, it was a welcome change after 2 disappointing reads. I am quoting the blurb from the back of the book for the plot. "When a new NASA satellite spots evidence of an astonishingly rare object buried deep in the Arctic ice, the floundering space agency proclaims a much-needed victory… a victory that has profound implications for U.S. space policy and the impending presidential election. With the Oval Office in the balance, the President dispatches White House Intelligence analyst Rachel Sexton to the Milne Ice Shelf to verify the authenticity of the find. Accompanied by a team of experts, including the charismatic academic Michael Tolland, Rachel uncovers the unthinkable—evidence of scientific trickery—a bold deception that threatens to plunge the world into controversy. But before Rachel can contact the President, she and Michael are attacked by a deadly task force…a private team of assassins controlled by a mysterious power broker who will stop at nothing to hide the truth. Fleeing for their lives in an environment as desolate as it is lethal, they possess only one hope for survival: to find out who is behind this masterful ploy. The truth, they will learn, is the most shocking deception of all…"
I can safely call it a scientific novel since it has a strong scientific backdrop. Dan Brown is a master story teller and this novel is a good example of his immaculate ability at crafting ingenious plots that grips his readers with intrigue and awe. The character development is great, the plot is fascinating. The fact that the plot involves NASA a great amount of details about advanced technology and weaponry is cited in the book which at times, went above my head. On those occasions I could not really picture the scene in my mind but non the less I knew what was going on and it seemed convincing enough. A movie based on this novel is going to be released this year and I am really looking forward to it. All in all it was an enjoyable read, a real page turner. If you like his books, you can't miss this. 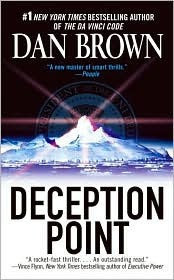 I remember loving this book..One of Dan Brown's best, actually.